The main feature of the temperature control trap is that it can set the condensate temperature discharged. * By causing the condensate to pool in front of the trap, it becomes possible to discharge the condensate at a much lower temperature than the original steam, for example at 60 °C or 80 °C. * Temperature of the condensate accumulating in the equipment or pipe and the product temperature cannot be set. What is the Purpose of a Temperature Control Trap? But aren't steam traps supposed to rapidly discharge any condensate that forms?' you may ask. An understanding of the reason for the development of the temperature control trap should help clear up any confusion about this. 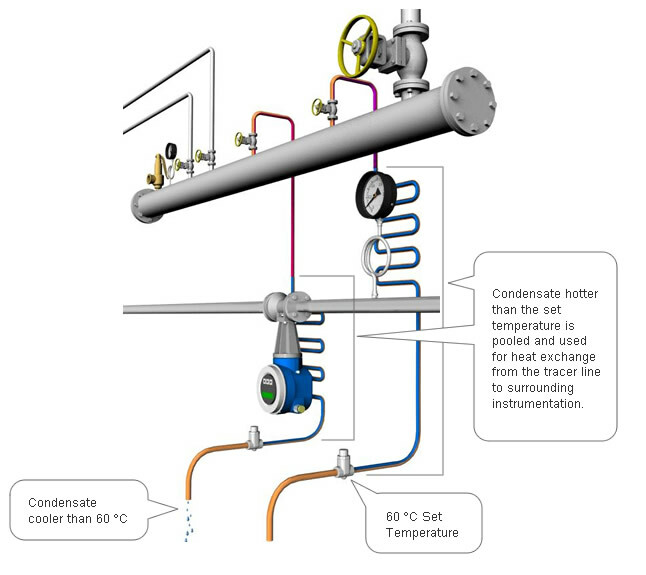 The temperature control trap was developed for use with tracer lines that are designed to prevent high viscosity fluids such as heavy oil from cooling during transport, as cooling causes solidification of high viscosity fluids. Heat from steam is used to maintain the temperature of heavy oil. 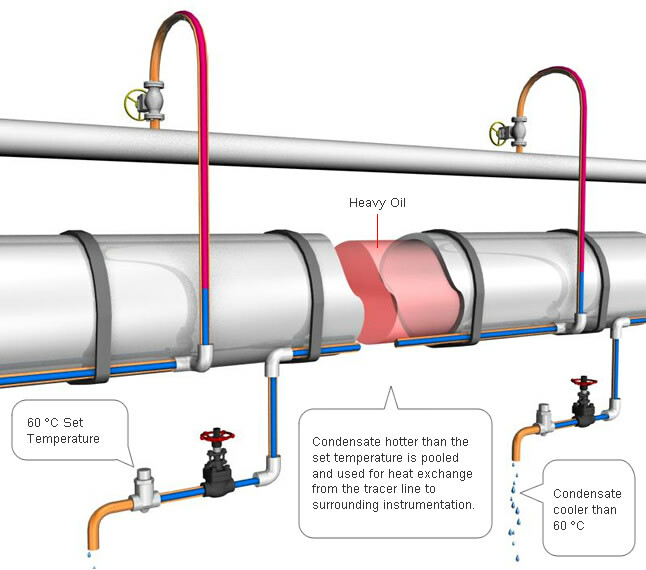 A temperature of approximately 40 °C is sufficient to secure the transport of heavy oil, but the temperature of steam is over 100 °C. Therefore, if the heat of steam was used directly as the heat source, there would be a danger of overheating the heavy oil. Reducing the temperature of a tracer line by means of a temperature control trap prevents the possibility of overheating the heavy oil. Can a Temperature Control Trap be Used as a Substitute for a Temperature Control Valve? When steam is used for heating, control valves and temperature control valves are often used. May the temperature control trap be used in place of these control valves? There is a crucial difference between the kind of temperature control provided by a control valve or a temperature control valve and that provided by a temperature control trap. Control valves and temperature control valves use the product temperature as their reference, while temperature control traps reference the temperature of the trap interior. Therefore, a temperature control trap cannot be used as a substitute for a control valve or temperature control valve in a typical heating situation. In addition to use on tracer applications for high viscosity fluids such as heavy oil, temperature control traps are also used on tracer applications to prevent the freezing of instrumentation. Tracer applications are not widely used, however, so temperature control traps are a specialized trap with a limited application. A temperature control trap deliberately pools condensate in order to prevent the overheating of the substance being heated. Condensate hotter than the set temperature is pooled and used for heat exchange from the tracer line to surrounding instrumentation. Use of temperature control traps is possible in some applications that make use of sensible heat (temperature control traps are not recommended for some applications which use sensible heat, contact TLV if you are unsure about a specific application using sensible heat). Use of temperature control traps is not possible in applications that make use of latent heat.